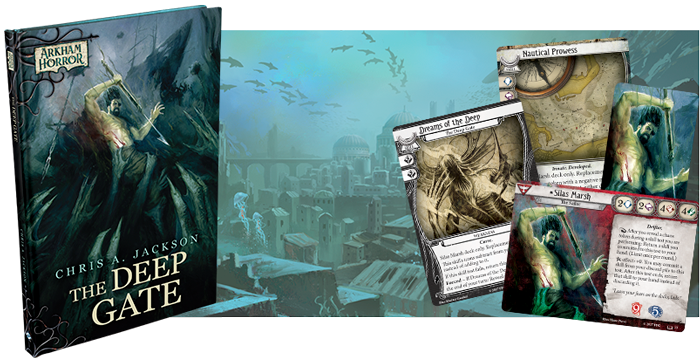 Fantasy Flight Games is proud to announce the upcoming release of The Deep Gate, a new Arkham Horror novella by Chris A. Jackson, which includes four new cards for Arkham Horror: The Card Game, now available for pre-order at your local retailer or on the Fantasy Flight Games website here! Silas didn't want to make the trip back to Arkham, but the chance to find answers about his malady was too enticing to pass up. He returned to the area in search of someone who could tell him whether the nightmares that plague his nights are some sort of family ailment, like dropsy or ulcers. There seemed to be a pall of silence hanging over everyone he spoke to, but one cousin seems willing to help Silas gain some insight. So, when desperate librarian Abigail Foreman comes to Silas with questions of her own, he cannot turn her away. Her ancient and mysterious tome, the Prophesiae Profana, points to a stellar event foretelling the end of the world, and painted in its margins are the same creatures that haunt Silas’s nightmares. After a few calculations, the pair determine that this terrible event will occur at Devil Reef in three days’ time. With the relentless rains that have been hammering New England, there is only one place where even an experienced sailor can hope to approach the reef from in time to stop this event. Silas must return to Innsmouth. 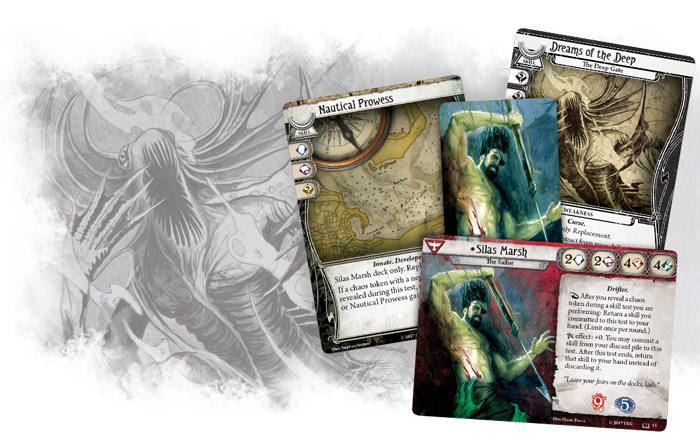 Within the pages of The Deep Gate, you'll find a thrilling story of nautical horror and heroism, along with fifteen pages of full color inserts. 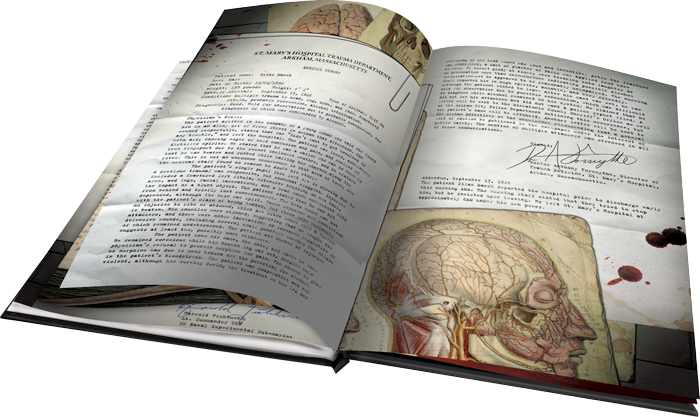 These documents provide you with every piece of evidence at Silas Marsh’s disposal, from journal entries and ocean maps to medical reports and official correspondence. With these documents, you can embody the role of investigator, solving the case alongside Silas Marsh. Perhaps the key to preventing this cosmic catastrophe is hidden within the lines of these pages. The adventure of The Deep Gate leaves the pages of its tome to expand your investigations in Arkham with four new cards for Arkham Horror: The Card Game! 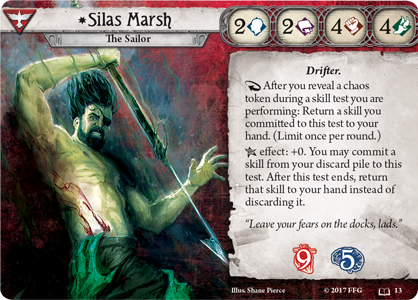 While Silas will return home from the sea and be released in an Arkham Horror: The Card Game product at a later date, this marks his first appearance in the game. Silas never asked to become part of the world of vengeful Elder Gods and creatures that defy the laws of reality. He was simply in the wrong place at the wrong time, making him a member of the Survivor class. Having left Innsmouth in favor of the seafarer’s life at a young age, Silas lacked a formal education, leaving him with an intellect of two. Instead, the ship was his schoolroom. Here, Silas learned think on his feet, and arduous days on an unforgiving sea equipped him with combat and agility of four. Accustomed to extended stays at sea, Silas is well-skilled at making the most of limited resources. 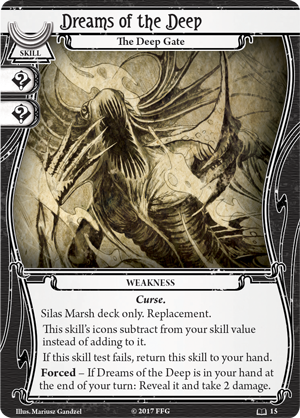 This ingenuity shines through in Silas’s ability—once per round after he reveals a chaos token during a skill test, he may return a skill card committed to that test to his hand. This sailor must also rely on his resourcefulness when using his Elder Sign ability. Silas does not have a strong link to the arcane and often does not believe in what he cannot see. In his mind, sailors may have their superstitions, but a lucky memento is no substitute for nautical prowess and well-kept equipment. When Silas draws an Elder Sign token from the chaos bag, he doesn't gain any direct bonus, but he may commit a skill to the test from his discard pile. Then, once the test is complete, he returns that skill to his hand instead of discarding it. In The Deep Gate, Silas seeks some solution to the Curse that haunts his sleep with Dreams of the Deep (The Deep Gate, 15). This personal weakness acts as a skill card for Silas. However, Dreams of the Deep’s two icons subtract from Silas’s skill value instead of adding to it! Unfortunately for the sailor, he cannot run from this malady and must instead overcome it. If the test that Dreams of the Deep is committed to fails, Silas must return the skill to his hand. And to make matters worse, if this card remains in the investigator’s hand at the end of his turn, he must reveal it and suffer two damage. Perhaps Silas’s one hope of overcoming these dreadful curse is to use every skill he has gained from his worldwide travels. Over the course of his years at sea, Silas has developed his Nautical Prowess (The Deep Gate, 14). When committed to a skill test, Nautical Prowess can boost any area where Silas feels ill-equipped, possessing willpower, intellect, and wild icons. 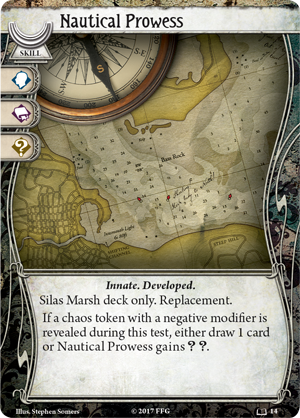 Then, if a chaos token with a negative modifier is revealed during a test, Silas may choose to either draw a card or have Nautical Prowess gain two wild icons. As the world begins to fall into chaos, there's no telling what Silas’s future may hold, but he is prepared to face any challenges that lie ahead. Are you prepared to join him? Leave your fears on the docks. Help Silas Marsh discover the secrets hidden in the depths of Devil Reef and decode the prophecy of The Deep Gate! Pre-order The Deep Gate (NAH13) at your local retailer today or on the Fantasy Flight Games website here!